THE AWARD-WINNING DREAMBABY® RETRACTABLE SAFETY GATE – NOW AVAILABLE IN A SLEEK BLACK VERSION, DESIGNED WITH STYLE AND SECURITY IN MIND! AND ALSO JUST LAUNCHING – THE NEW DREAMBABY® HARROGATE BED RAIL – IDEAL FOR KEEPING TODDLERS SAFE AND SOUND IN THEIR BEDS, GIVING PARENTS PEACE OF MIND EACH AND EVERY NIGHT! Amazing gate ever!! I’m pleased they have created retractable gate for satisfied parents like me. Wide enough to reach a wide size door, just like the one we have in our living room, in, which I assumed, is what the product is supposed to be. The Dreambaby® Retractable Gate in Black (F943, RRP$89.95) is designed with all the qualities of its original white version, loved the world over! It is designed to be adaptable to fit different sized doorways, hallways, stairways passageways and vestibule areas (with openings of up to 140cm), and comes with a one-handed easy opening system. The sturdy and durable mesh barrier winds back onto itself to the side when not in use, saving valuable space. The retraction feature also makes it easier for parents and other adults to pass on the stairs and through rooms cutting down on any tripping hazards. This gate also comes with two sets of fittings so the one gate can be used in two separate places as needed. The new black version is sophisticated and will be popular in homes that command stronger colour palates. 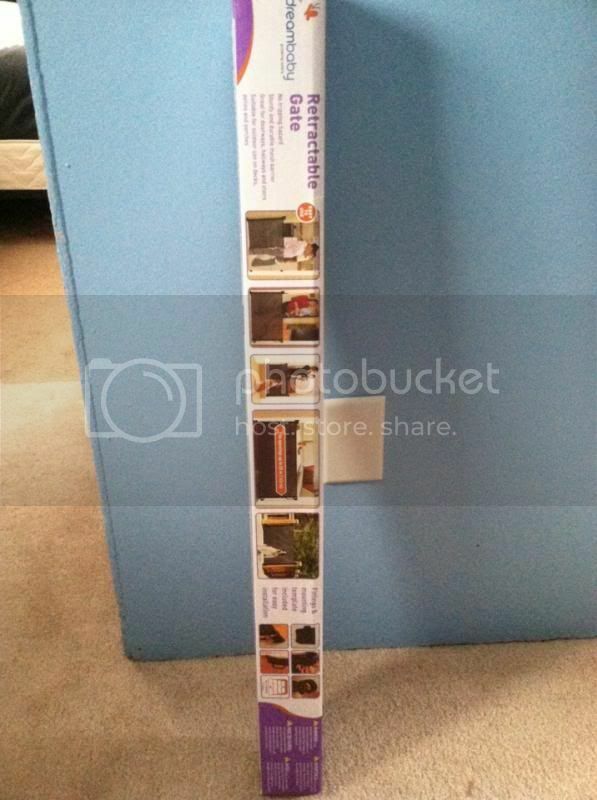 Dreambaby® Harrogate Bed Rail (F770) RRP$49.95. Keeping children safe in the day is important, however, keeping them safe in the night, during their sleep is almost priceless! The new Dreambaby® Harrogate Bed Rail is the must-have safety item for smaller children and toddlers training in a BIG bed. As parents know, children wriggle and move a lot during their sleep. Although some children are more active sleepers than others, it is so important they don’t fall out of their beds, as this can be quite startling and shocking for little children, particularly those who have recently graduated from a cot into a bed. For more information on both these family friendly products from Dreambaby®, visit www.dreambaby.com.au or call (02) 9386 4000 or in New Zealand, call (09) 274 8788. DREAMBABY® LAUNCHES A RANGE OF LITTLE BUT PERFECT PRODUCTS THAT REALLY MAKE A DIFFERENCE TO CHILD SAFETY AND PARENTS CONVENIENCE. 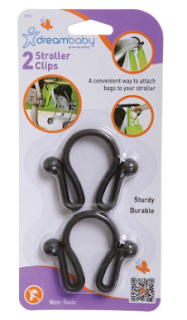 The NEW Dreambaby® Stroller Clips (2 pack) are a convenient way to attach bags to your stroller, perfect for taking the hard work out of carrying shopping, nappy bags and handbags. So small, yet so helpful! Lightweight and versatile. Easily used with one hand. Alleviates foraging around under the pram or stroller for the things you need! Another NEWLY launched little gem is the adorable Dreambaby® Baby on Board Tiger Sign. A perfect match to the new Adjustable Car Shades with hand drawn jungle illustrations on both sides which were launched last month, this sign will alert other drivers on the road that your precious cargo is inside your travelling vehicle! It will also bring a smile to your little one’s face. The NEW Dreambaby® Butterfly Outlet Plugs are another small but invaluable safety product, keeping children safe from potential electric shocks! Simple insert the Dreambaby® Butterfly Outlet Plugs into all unused power outlets to prevent curious toddlers from inserting foreign objects into the source of dangerous electrical currents! RRP $2.95 for a 24 pack Product code F838. The Dreambaby® Retractable Gate in Black is UV-protected, and made with galvanized hardware, which allows the gates to be used indoors (in rooms, doorways, hallways, stairs and more) and also outside (on decks, patios and porches) in most outdoor conditions. The gate also complies with standard ASTM F1004-07. Installation instructions. Dreambaby® Harrogate Bed Rail (F770) RRP$49.95. Keeping children safe in the day is important, however, keeping them safe in the night, during their sleep is almost priceless! The new Dreambaby® Harrogate Bed Rail is the must-have safety item for smaller children and toddlers training in a BIG bed. As parents know, children wriggle and move a lot during their sleep. Although some children are more active sleepers than others, it is so important they don’t fall out of their beds, as this can be quite startling and shocking for little children, particularly those who have recently graduated from a cot into a bed. DREAMBABY® unique adjustable car window shades with gorgeous playful hand-illustrated animal designs on both sides for extra enjoyment. These shades are perfect for keeping your little ones protected from the strong, often damaging sun and glare while adding to the fun of being out and about on Safari in the car! Adjustable Car Window Shade – Tiger (F236) & Zebra (F237) RRP $9.95 each. Adjustable Car Window Shade – 2 Pack Tiger & Zebra (F238) RRP $13.95. Extra Wide Adjustable Car Window Shade – Tiger (F266) & Zebra (F267) RRP $13.95 each. Extra Wide Adjustable Car Window Shade – 2 Pack Tiger & Zebra (F268) RRP $23.95 each. The Dreambaby® Adjustable Car Window Shades measure 35.7cm (14.06″) wide by 48cm (18.9″) when they are completely unrolled, and are suitable for stationary or wind down windows. The Dreambaby® Extra Wide Car Window Shades are ideal for larger cars and van windows and are also suitable for stationary or wind down windows. The Dreambaby® Extra Wide Car Window Shades, when completely unrolled, reach 50cm (19.5″) in length, and LOCK into the desired position on your window. Both the Dreambaby® Extra Wide Car Window Shades and the Dreambaby® Adjustable Car Window Shades simply roll up very easily and efficiently when they are not in use. The Dreambaby® Extra Wide Car Window Shades attach easily to windows with heavy-duty suction caps (which won’t damage your car windows or tinting). Keep your children happy, cooler and more protected with these beautiful Dreambaby® Car Window Shades that have been illustrated front and back for maximum impact. This Article is Advertorial in nature and the views and opinions of authors expressed within this document are the authors. The presence of any advertisement in or with the magazine does not imply endorsement or guarantee by Family Capers of the product or service, or of the manufacturer or provider. Family Capers also accept no responsibility for any errors or omissions contained within this document. In particular, Family Capers shall not be liable for any loss or damage whatsoever, arising from the usage of information contained in this document. Dreambaby® is an internationally renowned child safety brand available in more than 100 countries. Our extensive range of products is specifically designed to provide parents and carers with modern home safety solutions that make it easy to help keep children safe in and around the home. Whether it’s in the kitchen, bathroom, car or out and about, Dreambaby® can help put your mind at ease with award-winning safety gates, locks and latches, thermometers to help when your child is sick, and toilet training and feeding products. The Dreambaby® Extra Wide Car Window Shades are ideal for larger cars and van windows and are also suitable for stationary or wind down windows. The Dreambaby® Extra Wide Car Window Shades, when completely unrolled, reach 50cm (19.5”) in length, and LOCK into the desired position on your window. 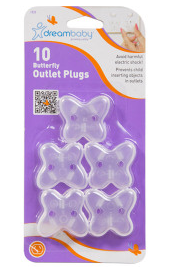 NEW DREAMBABY® BUTTERFLY OUTLET PLUGS The NEW Dreambaby® Butterfly Outlet Plugs are another small but invaluable safety product, keeping children safe from potential electric shocks! Simple insert the Dreambaby® Butterfly Outlet Plugs into all unused power outlets to prevent curious toddlers from inserting foreign objects into the source of dangerous electrical currents! NEW DREAMBABY® STROLLER CLIPS (2 PACK) The NEW Dreambaby® Stroller Clips (2 pack) are a convenient way to attach bags to your stroller, perfect for taking the hard work out of carrying shopping, nappy bags and handbags. So small, yet so helpful! It’s important to practice good oral hygiene with your children from a very early age, even if they haven’t got any teeth yet. In fact using special rubber toothbrushes on teething babies gums can actually offer them some relief. Dreambaby have come up with a fantastic 3 Stage Baby Gum & Tooth Care Set which includes 3 different toothbrushes to suit your baby’s different stages of tooth development. Dreambaby have been kind enough to give me 2 packs of these fab toothbrushes, 1 blue pack and 1 pink pack, to giveaway to my lovely readers. The giveaway is open to UK residents only and if you’d like to be in with a chance of winning then just fill in the Rafflecopter form below. We received a bedrail and since my daughter is now 21 months and thought it was SO cool that she could climb out of her crib on her own, we moved her into a toddler need. The bedrail isn’t great for a toddler bed but if she had a twin bed it would be awesome. It has the metal bars that sit under the bed to hold it in place but they also added 2 straps with metal circles to put on the other side of the bed as added support to make sure that the rail doesn’t slide out of place. I’d highly recommend this if your transitioning your toddler to a twin bed. Even though it’s sort of big for a toddler bed it still works well and she hasn’t been able to move the rail, (believe me this girl moves like crazy while she’s sleeping) The rail will also fold down so that during the day/morning they can get in and out of bed easily. It does have the breathable mesh so if the child’d face were to be against it they wouldn’t have any issues breathing. When kids come into your life and home a lot of things change. And one of the main things I noticed when I had children is how much of my things I needed to get rid of and also how I had to childproof the home and make it a safe place for them. Not only does it ensure the kids are safe it is also a great piece of mind for us parents/grandparents/carers. Thankfully to help me do this I had Dreambaby in my life along with a few other international children care products. Recently Dreambaby asked me if I would like to review some of their newer products to which I jumped straight onto as it is a brand I love and trust. The products they sent me were not only to keep my house safe but also to make life as a mum a tiny bit easier and more convenient. The NEW Dreambaby Stroller Clips (2 pack) are a convenient way to attach bags to your stroller, perfect for taking the hard work out of carrying shopping, nappy bags and handbags. So small, yet so helpful! Ø Made from sturdy materials. Ø Lightweight and versatile. Easily used with one hand. 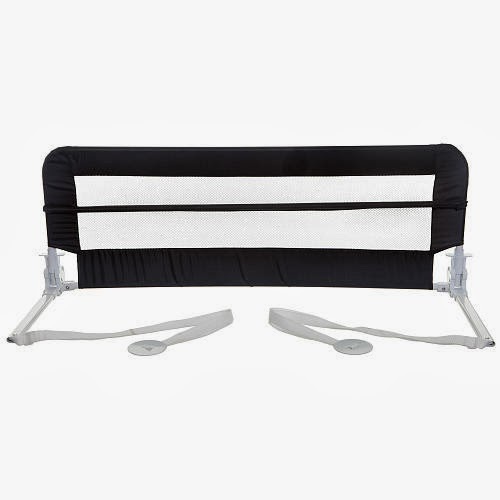 Ø Alleviates foraging around under the pram or stroller for the things you need! Oh, I don’t know why these did not come into my life earlier. It is so good to be able to go shopping and not have to make multiple trips back to the car, or to try and juggle the bags and push a pram and make sure the kids stay near me. My partner broke our brake lever on the pram because he thought it would be smart one shopping trip to hang bags on there L It is fair to say he approves of these clips to. They are small and take up no space at all but can take quite a bit of weight. You just have to be careful not to stack to many bags on as it will weigh down the back of your pram and possibly tip the pram. The NEW Dreambaby Butterfly Outlet Plugs are another small but invaluable safety product, keeping children safe from potential electric shocks! Simple insert the Dreambaby Butterfly Outlet Plugs into all unused power outlets to prevent curious toddlers from inserting foreign objects into the source of dangerous electrical currents! These are cheapest and yet one of the best safety products in my home. I know how tempting it may be to a child to try and stick things in a powerpoint and a year or so ago I saw my 4year old talking to it as she said it looked like an alien face. So this did worry me but luckily it never went any further then talking to them. Now that my 2 year old has found her legs and is learning to explore new and wonderful things, I have the feeling that she would take things further with the plug points so it came at great timing this product. I think it is cute that they block the plugs and don’t allow the children to easily pull them off but still look pretty and SAFE! Hayley much prefers talking to the butterflies then the alien that is for sure haha. Visit the Dreambaby® web site at www.dreambaby.com.au or call (02) 9386 4000 or in New Zealand, call (09) 274 8788. The ‘Style’ Dreambaby® Appliance Lock F1004 (RRP $6.95). Designed with an EZY-Check® Indicator, which allows parents to check quickly that it is properly secured by displaying red for unlocked and green for locked, it’s ideal for most ovens, and will suit other appliances too. ‘Style’ Dreambaby® Microwave & Oven Lock F1001 (RRP $7.95). This heat resistant lock will help prevent potential burns as the lock ensures children are unable to tamper with ovens, and microwaves. ‘Style’ Dreambaby® Refrigerator Latch F1002 (RRP $5.95) will help prevent little people reaching up at large, heavy items in the fridge which could fall. It’s also a necessary safety tool if you are storing prescription medicines, alcohol and other cooking items. ‘Style’ Dreambaby® Sliding Lock F1005 (RRP$5.95). This lock fits easily onto cabinet knobs or D-shaped handles. It’s Ideal for the kitchen and laundry, and closes with a simple sliding action. Dreambaby’s® ‘Style’ Flexible Multi-Purpose Latch F1007 (RRP $6.95) and Dreambaby’s® ‘Style’ Mini Multi Purpose Latches F1008 (RRP $7.95) are excellent safety solutions to help secure the home and are suitable for use on a range of surfaces as well as fridges and freezers. www.dreambaby.com.au or call (02) 9386 4000. These products are great for keeping little hands away from things they shouldn’t be touching. Best of all they look stylish too. The house is now a much safer place for my little 9 month old boy who would love to be into everything at the moment.